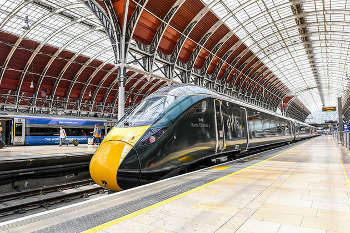 The transport secretary has hailed the launch of new bi-mode (diesel/electric) Intercity Express trains on the Great Western Railway route, but the trains’ inaugural journey was marred by a late departure, an even later arrival and faulty air conditioning. Chris Grayling travelled on the first of the new £5.7bn fleet of Intercity Express trains from Bristol Temple Meads to London Paddington on Monday morning (16 October). The fleet, which is being built at Hitachi Rail Europe’s manufacturing facility at Newton Aycliffe in County Durham, will be rolled out across the Great Western and East Coast lines over the next three years. Mr Grayling said: ‘This Government is investing record amounts to modernise Britain’s rail network and give passengers the faster, more comfortable trains and the better journeys that they expect. ‘These new state-of-the-art trains show our commitment to put passengers at the heart of everything that we do and will carry people across Britain, from Swansea to Aberdeen and London to Inverness. Unfortunately for Mr Grayling, the very first of these brand new trains was reported to be 25 minutes late departing because of technical issues, arriving 41 minutes late. The BBC reported that passengers also had to dodge drips of water that leaked from an air conditioning unit, which was subsequently cordoned off. The Department for Transport said the launch was the beginning of a huge change for passengers that will deliver more than 4,000 extra seats into London Paddington in the morning peak from 2018, and more than 12,000 extra seats into London Kings Cross by the end of 2020. The Government-led Intercity Express Programme brought together Hitachi Rail, Great Western Railway, Virgin Trains East Coast and Network Rail to design, develop and build the new trains and supporting depot infrastructure. The (Labour) Government had originally intended to order both bi-mode and fully electric trains for the Great Western route but ministers announced last year that all trains would be bi-mode. In July, following delays and cost overruns Mr Grayling cancelled Network Rail’s programme to electrify the whole route.